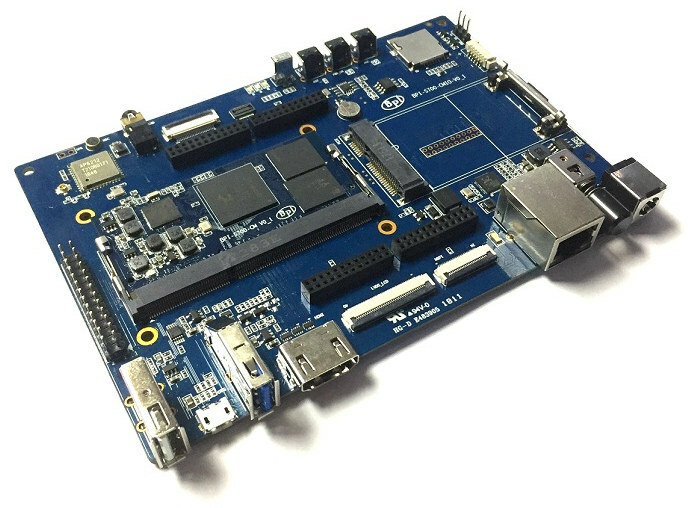 SinoVoIP has launched many development boards & SBCs under the Banana Pi brands, but so far they had not designed any system-on-modules (SoM). Banana Pi BPI-S64 Core is their first SoM, which they refer to as “Compute Module” for the compulsory Raspberry Pi reference, and it’s not based on Allwinner or Realtek processors used in many of their recent boards, but instead an Actions Semi S700 quad core Cortex A53 processor. 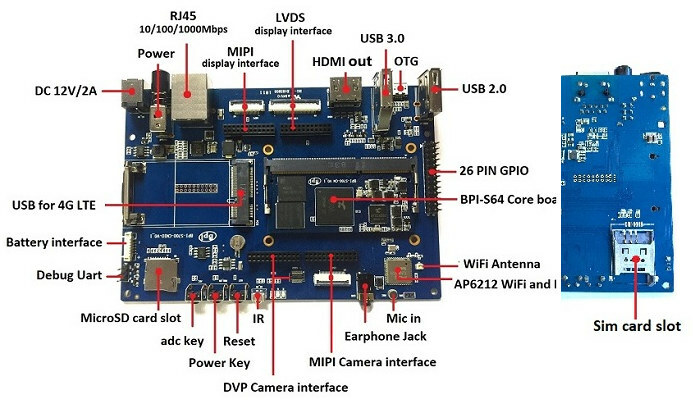 The company also provides Banana pi BPI-S64 core kit for getting started with the module. I’m fairly confident some mistakes have found their way into the specifications above, as there are a bit all over the place in the Wiki, which for now provides only limited hardware information. There’s no word about software but Android and Linux should be supported. Banana Pi documentation and firmware support is usually poor for hobbyist, but for companies – which are the target of such modules – support *might* be better. Banana Pi is also used to make early announcements for their product, and while they now have made the first samples, the actual product launch is likely 3 to 6 months away. I don’t see anything interesting here. S700 CPU is older technology, similar to Allwinner A64. Only Android 5.1 available. The cellular stuff is nothing special, any CPU can attach to a USB cell module. It does have way better video encoding than the A64. A64 video encoding is close to being unusable. S700 would be viable if they had Android Oreo for it. I’m done with messing around on ancient Android. Google is in the process of actively blocking anything before Android 8 from the Play Store. Not implement yet, but they have announced that it is coming. Existing device IDs will have access grandfathered in, but no new pre-Android 8 devices will be allowed Play Store access unless you go to a developer website and type in your device ID. The idea is to force people to stop selling pre-Android 8 devices. Cubieboard7 (also S700) ended up being $160. It seems to be a failure, no one is stocking it except Actions Semi themselves. I suspect this product will fail. It is going to fail because you picked the wrong SOC, not because of the DIMM module. DIMM modules are a good thing and they do sell. There are multiple companies that only produce DIMM modules and nothing else. It’s progress! Actions Semi kernel for their 32-bit S500 three years ago was a 3.10.37 (but after poking them for some time through LeMaker at least they patched it up on their own to 3.10.100 or something like that back then). Really impressive that there are still SoC and board makers acting that way and not giving a sh*t about decent software support at all. And another interesting detail. The video shows they run Mate 1.8.1. Now let’s look at https://wiki.debian.org/Mate and we see they’re using a Debian Jessie OS image which makes perfectly sense given that Stretch is the actual stable release since a year now. Also, Jessie’s EOL date is 6/6/2018, in 3 days. So, almost week full of software “support”. Nice, another board with kernel 2.4, android 1.6 and u-boot 2005 “support”. Good Try, but i think they choice wrong SoC again, guys look to RockChip please. Would be a better choice RK3328 (Price/Performance/Support). > for companies – which are the target of such modules – support *might* be better. The other Actions Semi SO-DIMM (S500 on LeMaker’s ‘Le Guitar’) was targeting clueless hobbyists only. How should this change here? Are ‘companies’ really interested in hardware for which zero upstream support but only a smelly BSP exists consisting of kernel/Android from 3 to 4 years ago? 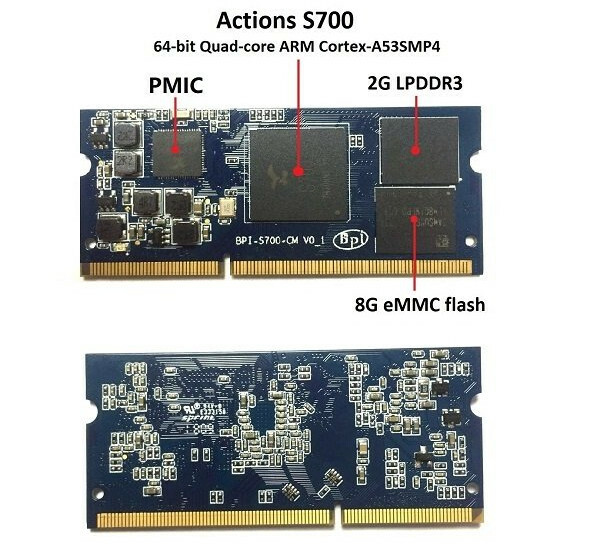 Their yet not released BPi-R64 will use MT7622A (dual-core A53 hopefully more or less compatible to 32-bit MT7623?) but no idea what their BPi-F2 will be based on. What could F be an indication for? Orange Pi hasn’t released that many new boards lately. FWIW, they also don’t update the software kit once there is full mainline support. For example U-Boot 2011 instead of 2018.05. Kernel 3.x instead of 4.16. How come? At least te U-Boot could be easily upgraded without any issues? Cubietech Limited are using the same SoC and S500, for some reason they is value in them. I’ve been informed Actions Semi S700 support (at least basic) was added to Linux 4.16.